P-Traps can be found at almost any fixture that drains water and are designed to prevent hazardous sewer gases from entering the building. A P-Trap is comprised of a curved “trap” called a J-Bend and a drain pipe called a Wall Bend. The Tailpiece on the Lavatory Drain fits into the P-Trap J-Bend, connecting to the Wall Bend, which then enters the wall. They are available with or without cleanout plugs. If one with a cleanout plug is installed it can be cleaned without removing and installing a new trap. S-Traps are also used to prevent hazardous sewer gases from entering buildings, and are designed to drain into plumbing below the floor for installations where there is no access to plumbing directly behind the wall. Because of their shape, J-Bends retain a small amount of water after the fixture’s use. This water in the trap creates a seal that prevents sewer gas from passing from the drain pipes back into the occupied space of a building or home. Vanity Traps are P-Traps which feature an extra-long (15”) Wall Bend to accommodate deeper Vanity installations. With trend setting innovations like our Clicker® Closure mechanism and our Daisy™ Grid Drain, OS&B® has set a new standard in Lavatory (Lav) Drain technology. OS&B® has all of your Lav Drain needs covered with a complete selection available in a variety of materials, configurations, sizes and finishes. With over 40 years of experience manufacturing Waste & Overflows (bath drains), and supplying to the Plumbing Trade throughout North America and to OEM suppliers around the world, OS&B® is known as a true innovator and the leading manufacturer of bath Waste & Overflows. First to market with such unique and innovative features as the Angle Adapter, Spin-on Tie Plate, Corrugated Overflow Tube on Offset Brass Waste & Overflows and our new SlideOn™ Faceplate, all designed to simplify and speed up installation. With a complete selection available in a variety of materials, configurations, sizes and finishes, OS&B® has all of your bath drain needs covered. Introducing our Testable bath drain Rough-in and Trim Program (Sold separately). Rough-ins available in ABS, PVC and Brass Offset and Direct styles. Trim Kits available with Bell, Square or Round shaped SlideOn™ Faceplate styles and in Clicker®, Twirl™ or Plug & Chain closure mechanisms. Choose from a selection of popular finishes including new Matte Black (available in Clicker® Trim Kits only). Our Integral Tub Drains are specifically designed for Freestanding Bath Tubs with an Integral Overflow or without Overflow. Available with a Brass or ABS fitting, and in Clicker® or Twirl™ closure mechanisms. Featuring a Strainer with Integral Overflow holes and unique vertical Weeping Channels (prevents buildup at Overflow Holes). Choose from a selection of popular finishes. The patented Island Tub Drain™ Freestanding Tub Rough-In – A revolutionary product minimizing the time and effort required to install a freestanding bath. Available in ABS (ITD35), PVC (ITD5135) and Cast Iron (ID357), Island Tub Drain™ allows the DWV system to be pre-plumbed before making the connection between bath drain and the p-trap. This means no access panels required below the fixture! Island Tub Drain™ contains a positive action seal against the supplied tailpiece connection kit and is compatible with virtually all tubs. The bath drain connection is now accessible by simply lifting the bath. In addition, the asymmetrical deck plate is designed not to interfere with the floor mounted tub filler rough-in and features easy lock mortar setting for slab construction. 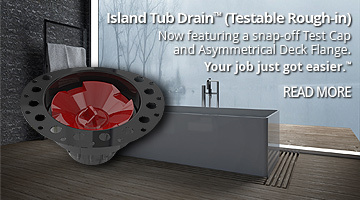 Island Tub Drain™ is testable for new construction. 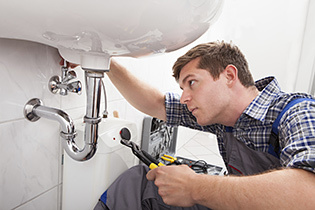 OS&B® is the leading supplier of plumbing parts to the trade only. ©2019. All rights reserved.